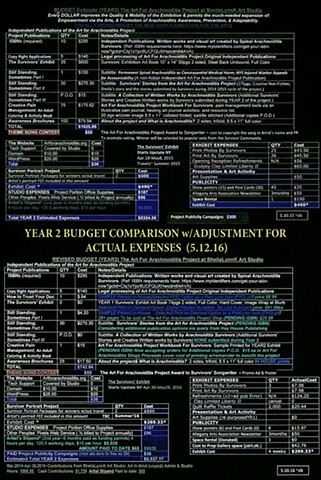 HERE IS A COMPARISON OF THE ESTIMATED YEAR 2 BUDGET FROM MAY 2015 vs. ACTUAL EXPENSES SO FAR. The YEAR 2 Survivors Art Exhibit is FREE and Open to the Public during Open Studio Hours until May 28th, 2016. Watch Video as we prepared for the Opening Reception. Arachnoiditis Survivors who do not work in the Visual Arts have a story to tell, too. Our Public Income/Expense Report shows where your money goes.